Photograph titled “Judy Chicago” by Jerry McMillan, 1970, gelatin silver print, 14”x11” Edition 20. Reproduction rights granted from the artist and Craig Krull Gallery, Santa Monica, CA. Using Judy Chicago’s feminist art teaching methodology documented in the Penn State archives, course participants will develop their focus in the course as action researchers, or as artists creating interactive content-based visual and performative art to engage community in an exhibition, titled Out of Here that will be held in the HUB’s Art Alley, March 19-April 27, 2014. 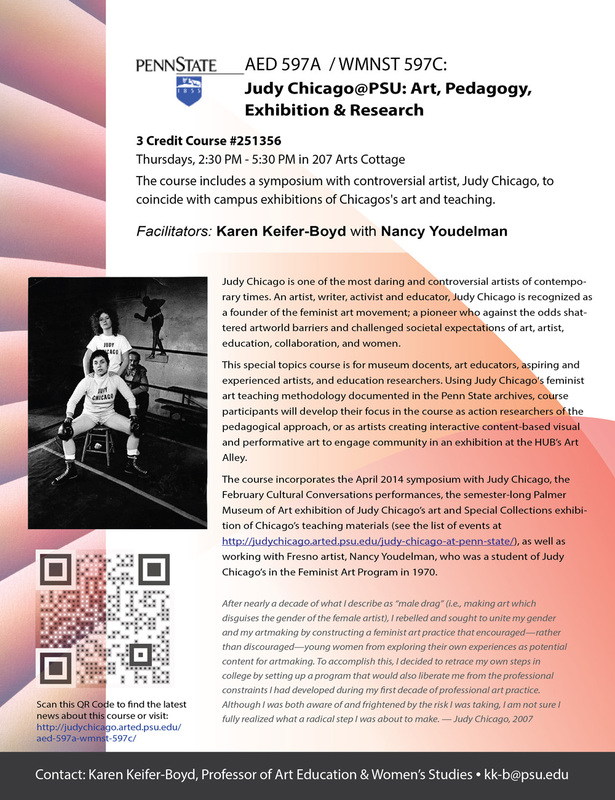 Required readings are listed on the course calendar at http://judychicago.arted.psu.edu/out-of-here/calendar/. Readings are linked on the calendar, placed in the ANGEL course site, or available from the Penn State Bookstore. The Patterson Building computer labs are open 24 hours a day, 7 days a week. All technology classrooms are equipped with a telephone. If you experience problems with computers or printers please call the Hotline at 8-777-0035. This number is staffed Monday – Friday, 7:30 a.m.-1:00 a.m.; Saturday &; Sunday, 8:00 a.m.-5:00 p.m. Also Media Commons provides one on one, group, and online technology support. You may check-out equipment at the Media & Technology Services (MTSS) at the Wagner Annex. University Policies and Rules Guidelines states that academic integrity is the pursuit of scholarly activity in an open, honest and responsible manner. Academic integrity is a basic guiding principle for all academic activity at The Pennsylvania State University, and all members of the University community are expected to act in accordance with this principle. Consistent with this expectation, the University’s Code of Conduct states that all students should act with personal integrity, respect other students’ dignity, rights and property, and help create and maintain an environment in which all can succeed through the fruits of their efforts. Academic integrity includes a commitment not to engage in or tolerate acts of falsification, misrepresentation or deception. Such acts of dishonesty violate the fundamental ethical principles of the University community and compromise the worth of work completed by others. Academic dishonesty includes but is not limited to acts such as cheating on exams or assignments; plagiarizing the words or ideas of another; fabricating information or citations; facilitating acts of academic dishonesty by others; claiming authorship of work done by another person; submitting work completed in previous classes; and/or submitting the same work to multiple classes in which a student is enrolled simultaneously. Plagiarism is the use of more than three consecutive words, ideas, or images of another author without proper citation. Proper citation formats must follow one of the academic writing style manuals such as APA, Chicago, MLA, or Turabian. All images and text from the Internet, journals, or books must have full citation to be used in your work. It is Penn State’s policy to not discriminate against qualified students with documented disabilities in its educational programs. If you need alternate arrangements or modifications to meet course requirements, please contact me during the first week of classes (see Americans with Disabilities Act, 26 July 1990, Penn State’s Nondiscrimination Policy, and the Office for Disability Services). Click here for information regarding eligibility for services and the procedures for obtaining services. Every effort will be made to comply with the intent of state laws or acts and the University Health and Safety Program in an effort to maintain a safe academic and working environment. Information and awareness of safety factors will be included in the course content when applicable. When using a computer the main safety practice is to keep your arm, wrist, and hand in a straight line as you use the keyboard or mouse to avoid muscle stress, inflammation, and injury. Also take breaks, stretch, and look at objects in the distance periodically. Use “Text Zoom” to increase the font size of Web pages to meet your vision needs. Click here for emergency procedures and phone numbers. Dial 911 for emergencies, (814) 863-1111 for University Police, or (814) 231-6110 for Centre Community Hospital Emergency Department. Patterson, room 304, has a phone by the podium to use (when there is not a class in session) to call off campus. Flashing lights and an alarm inside a building mean fire. Exit quickly. Attendance is required and very important to learning in this course. However, you are encouraged to attend professional conferences, therefore, your absence in class for such attendance is excused with prior arrangements. This course is in accordance with Faculty Senate Policy 42-27 on Attendance: The faculty senate policy, effective Fall 2002, states that students who miss class due to legitimate, unavoidable reasons such as illness, injury or family emergency should have the opportunity to make up evaluative events. While notifying the instructor in a timely manner is a key expectation, the senate policy does not mandate official documentation of student illness or other unavoidable reasons for absence. In preparing the calendar for an academic year, the University makes every effort to avoid conflicts with religious holidays. However, when conflicts are unavoidable, please notify me to make special arrangements.